Kvas, a mildly alcoholic drink made from bread, has a long history of being a drink of the common people. The recipe involved soaking leftover dark bread in hot water and left to ferment for a few hours, adding honey, fruit, or sugar for sweetener as desired. Kvas was cheap to make and the yeast provided nutritional benefits to an otherwise limited diet, so becoming a staple for the Russian peasantry. In the 19th century it became more popular than in earlier times, even enjoyed by the nobility on occassion. 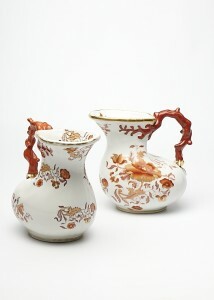 The degree of ornament applied to these kvasniki, pitchers for kvas, hints at the newly elevated status of the beverage. Of the askos form, modeled after ancient Greek goat-skin containers, they recall a renewed interest in classical art. In the second half of the nineteenth-century, applied decorations like flowers or bright red coral, as seen here, became fashionable. These decorative yet functional vessels attest to how a simple beverage transcended class boundaries, to the extent that the Russians, in the words of Pushkin, “like fresh air they loves kvass”.